Add a Second Hard Drive or SSD to your HP Envy 17-u000 to u100, u018CA, u108ca, u110nr, u109dx, u163cl, u177cl up to u296cl series laptop using your laptop's optical drive bay. Add it as a second hard drive in the laptop in lieu of a SATA Optical drive. 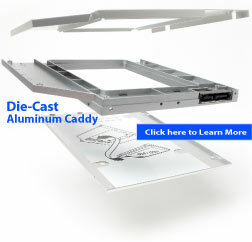 This caddy is designed for you to transfer your optical drive faceplate/bezel to the front of the drive caddy. Attach your optical drive's faceplate to the caddy.